No need to budget for an annual card fee. The SBS Visa Credit Card has no annual fee. You'll earn $1 for every $150 spent on Eligible Transactions*. Get up to 55 days Interest Free on your purchases when paying off your full balance each month. 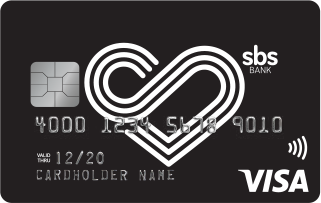 Your SBS Visa Credit Card uses Visa payWave, a secure contactless payment technology which helps you spend less time at the check-out with no need to enter your PIN for purchases under $80 NZD. Your SBS Visa Credit Card is protected by "Verified by Visa" which is an additional security feature for online shopping at participating sellers. Access your account 24/7 with SBS Bank Internet Banking and Mobile App. Our Contact Centre is also available for you to report lost or stolen cards on 0800 727 2273 or +64 9 623 7554. Purchase interest rate 18.5% p.a. Cash advance interest rate 21.5% p.a. There are additional fees which also apply to the Credit Card, a full list of our interest rates, fees and charges can be found here and these are subject to change. Additional Lending and eligibility criteria apply. The SBS Bank Visa Credit Card is issued by SBS Money Limited a 100% Subsidiary of SBS Bank. SBS Visa Credit Card Conditions of Use apply, are subject to change and can be found here or alternatively are available on request and free of charge from any branch of SBS Bank.